This is a nuanced and well-documented exploration of the controversies around the early Veterans Bureau. In 1921, with soldiers back from the Great War in need of medical care, the Harding administration introduced the Veterans Bureau under the leadership of Charles Forbes. Rosemary Stevens documents the rise and fall of Forbes in A Time of Scandal, a thorough account of how the former soldier moved toward corruption. 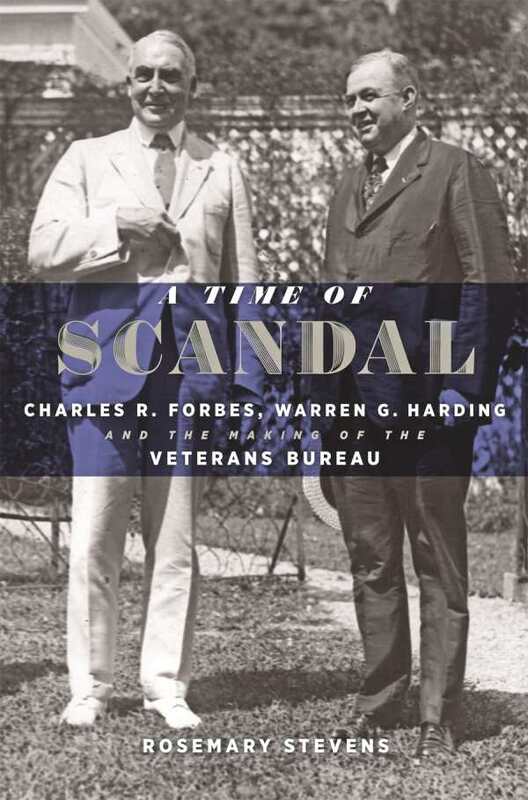 While Forbes still comes across as a flawed character, Stevens’s book argues that he doesn’t fully deserve the dark reputation he gained for his time at the Veterans Bureau. Stevens deploys a great deal of research, from letters between key players to financial records and news stories, to detail the political infighting that occurred during the creation of the bureau, and the way Forbes’s personal relationships with shady characters came to color public perception of him. From the unreasonable demands of the American Legion to clashes with the leaders of departments, the various interests at play make for intriguing reading. The book is smartly structured, with its first third devoted to background, a middle act focused on numerous scandals, and a last portion that shifts to Forbes’s trial and conviction. This last section, in which Forbes’s past returns to haunt him, is particularly compelling. The former director comes across as both a man who plays with the truth, and one who was scapegoated by powerful people. Throughout, Stevens does an excellent job of introducing each of the myriad threads that eventually formed the web around Forbes—including his friendship and falling out with Elias Mortimer, a successful grifter who later testified against Forbes, and whose claims helped seal the conviction. These kinds of tangled relationships make the human side of the scandals stand out, along with Stevens’s excellent documentation of the money and numbers involved. A Time of Scandal is a multifaceted and strong account of an interesting time.